A slender female carrot wasp nectars in the early evening sun. One recent evening, a thread-thin burst of movement caught my eye in our garden. It was a wasp — slender, agile and fast as it nectared in the early evening sun; and unlike most wasps, it held its abdomen at an unusual vertical angle. It was too thin and small to fit into the familiar wasp categories. 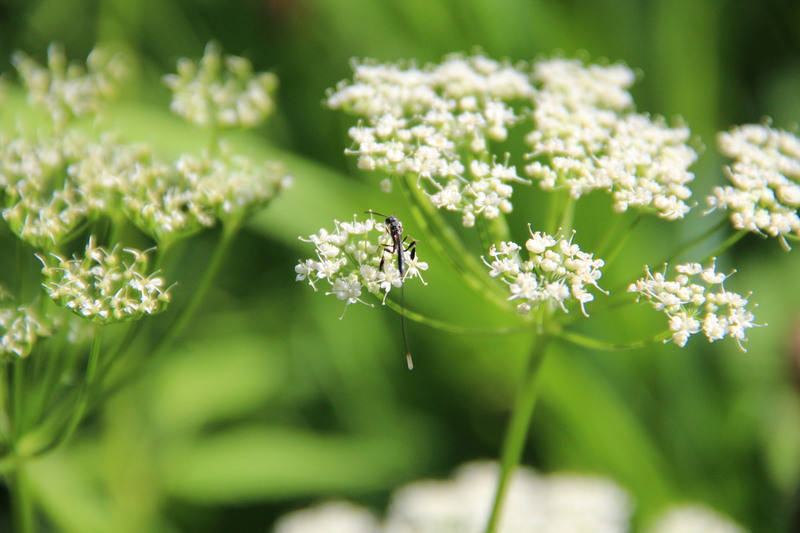 After searching several resources, I identified it: a carrot wasp in the family Gasteruptiidae spp. (There are 15 different species in North America.) 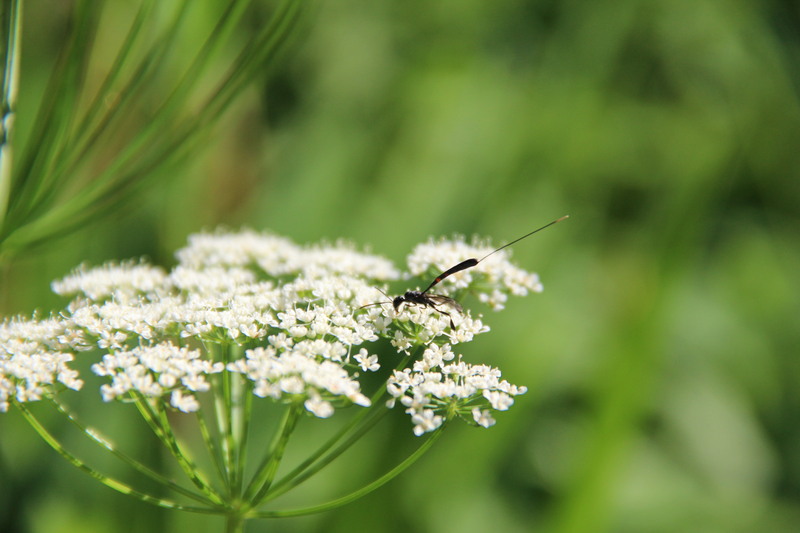 Adults feed on the nectar and pollen of plants in the carrot family, especially wild carrots and parsnips. Carrot wasps have enlarged areas on the back legs and the female has a long ovipositor. Carrot wasps are a type of parasitic wasp. Rather than building a colony, or their own individual cells, they seek out the nests of other solitary bees and wasps, such as digger bees and mud daubers. A female carrot wasp punctures a cell of the other bee or wasp’s nest, inserts her long ovipositor into the cell and lays her egg. Depending on the type of carrot wasp, when its egg hatches, the larva will eat the host bee/wasp’s larva, eat the larva’s food, or do both! Besides the abdomen being held vertically, other identifying characteristics include a visible, prominent neck, a black body with reddish-orange bands on the abdomen, and enlarged areas on the back legs. These wasps are most common during June, July and August. The first spring that we lived in our home, a large patch of wild columbine (Aquilegia canadensis) bloomed outside the back porch. The red-orange and yellow blooms of wild columbine dominate woodlands and rocky areas of Minnesota and eastern North America in early June. Also called Canada columbine, or eastern red columbine, these native wild flowers are a favorite source of nectar for hummingbirds and bees. 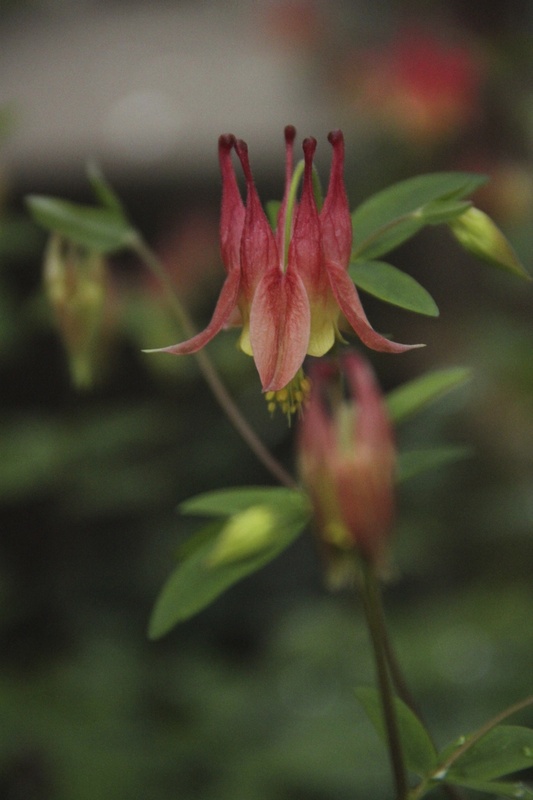 Canada columbine (Aquilegia canadensis) is native to eastern North America. The entire patch in our yard was native Canada columbine. That summer, I planted a small area of blue and white Colorado blue columbine (Aquilegia caerula), native to the western United States, in a different section of the yard. Over time, nature and the bees produced lovely hybrid flowers, ranging from dark purple, to violet, a cranberry color, and pale, lemony pink. Individual columbine do not live a long time, so the colorful hybrids usually last three or four years. However, Canada columbine produce dozens of shiny black seeds that keep the original native wildflower growing abundantly. The seeds often take root in small cracks in our stone garden wall, similar to the rocky habitat they favor in nature. But they also pop up in many different spots around the backyard in both sun and shade. 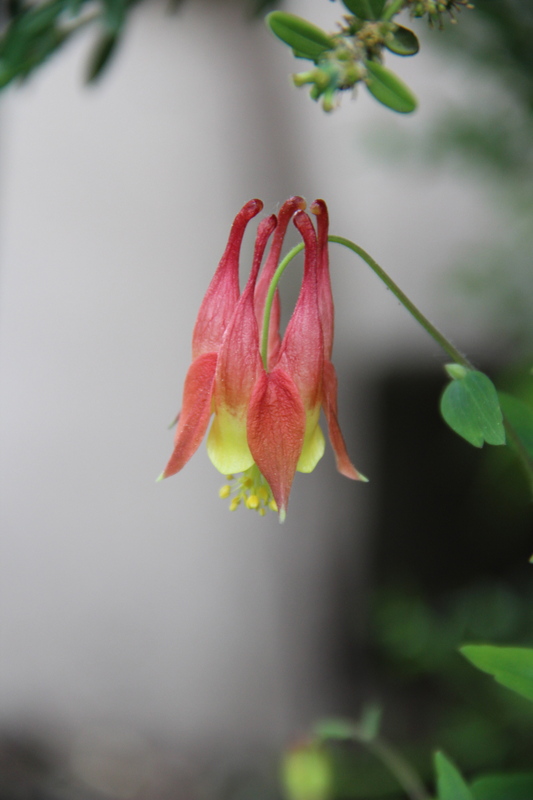 A cranberry-hued hybrid columbine — thanks to the bees. A violet hybrid of Canada columbine and Colorado blue columbine. The scientific and common names for this plant reflect the blossom in two different ways. 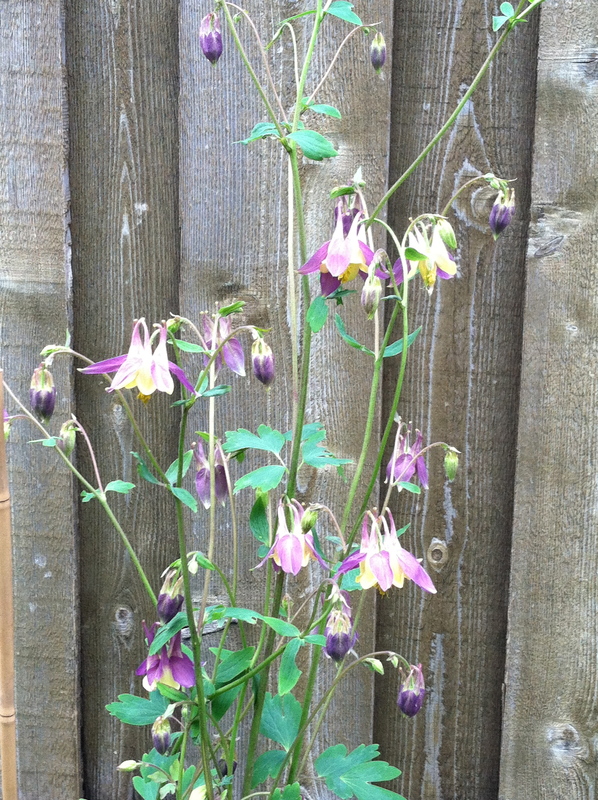 Aquilegia, from the Latin term for eagle, represents the flower as the talons of an eagle. I like the common name columbine, which is derived from Columba, the Latin for dove. Each section of the flower looks like the outline of a dove — from its tiny head, down through the oblong body and pointed tail. The entire blossom resembles a group of five doves. 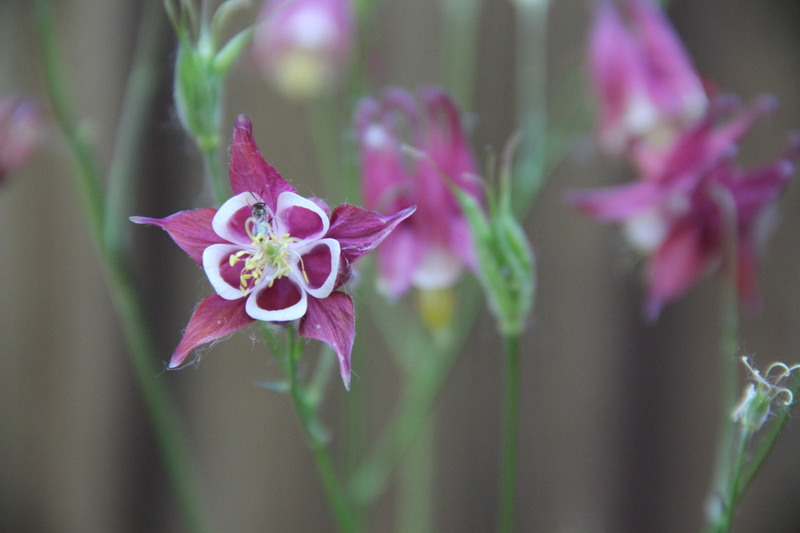 The “five doves” form the blossom and give columbine its common name. Whether you see the eagle or the dove, columbine is a beautiful spring wild flower and an important source of nectar for insects and hummingbirds. It also adapts well to gardens, especially rock and wall gardens. The colorful flower, scalloped foliage and large seed pods make it an interesting plant for much of the spring and summer. 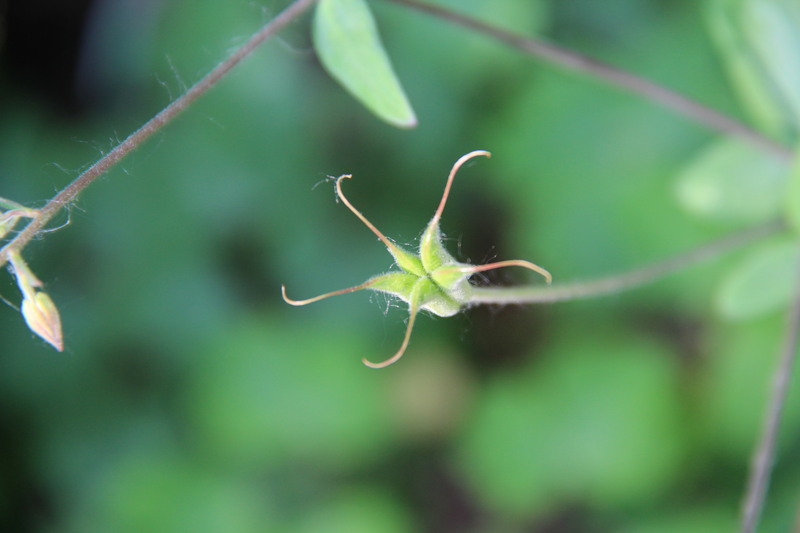 The sticky green seed pod will ripen and split open to release shiny black seeds.